REDMOND, Wash.--(BUSINESS WIRE)-- At the GameStop Managers Conference in Las Vegas, Nintendo announced that the New Nintendo 3DS system will launch in the U.S. as part of a special bundle on Sept. 25. The bundle includes the new hand-held system, the upcoming Animal Crossing: Happy Home Designer game, two cover plates and one amiibo card at a suggested retail price of $219.99. The more compact New Nintendo 3DS system joins New Nintendo 3DS XL, which has been available since Feb. 13. 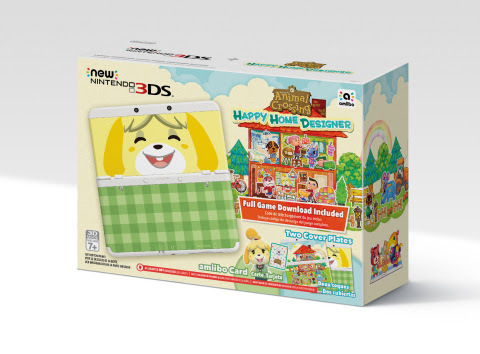 Various amiibo cards launch with the Animal Crossing: Happy Home Designer game on Sept. 25. Tapping compatible amiibo cards while playing Animal Crossing: Happy Home Designer is a way to meet favorite Animal Crossing characters with their separate personalities and design requests in the game. People who own the Nintendo 3DS, Nintendo 3DS XL or Nintendo 2DS systems can still use the cards to enjoy Animal Crossing: Happy Home Designer by purchasing the Nintendo 3DS NFC Reader /Writer accessory at a suggested retail price of $19.99. The wireless accessory also launches on Sept. 25and allows players to enjoy amiibo figures and cards on all other systems in the Nintendo 3DS family.